"As The Visitor walked further up the hillside, 100 feet or so behind the old house the same, strange amalgam of thrill and sorrow passed across him. He saw the big rock up ahead of him and the cluster of small concrete markers scattered around it and knew that this was where the great, echoing barks of the watchful collies had gone. And here, too, there now was only silence. 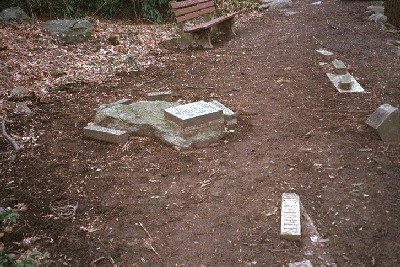 "This was the main burial place of the Sunnybank dogs. There were a few others -- the ancient graves down in the woods by the lake where the pets of Terhune's parents had been buried. And Lad's famous place of honor. And, for some reason, there were two other isolated graves -- those of Bruce and Jean -- on the hillside south of the house, high above the old rose corridor. "But here, on the hill, just behind and above the decrepit house, was the burying place of most of the Sunnybank collies. Here, where an old man and woman could look out from the house now and then and see the markers among the trees.